I have nothing to say about xylophones except that I remember wanting one as a child. To me, they were like pianos you could bash with a hammer. Which was probably why when I got one, it broke. It had keys (do you call them keys? let me look it up … oooh, I learned something new) bars made of rainbow-coloured pieces of metal that eventually sounded less melodic than if I’d had a series of tin cans lined up. What did I learn? I learned a xylophone has wooden keys and the ones with metal keys are glockenspiels. So there you go: I’ve never owned a xylophone. I feel like my whole childhood was a lie now. Thanks Wikipedia. Categories: Blogging, Funny, Life, Opinion, Random | Tags: #atozchallenge, absolutely not A to Z Challenge 2018, glockenspiels vs. xylophones, Humor, humour, inspiration, musical instruments, sad childhood, what's the difference between | Permalink. Gisele: Thanks for coming out for coffee with me. Jose: Oh no problem. It was … nice. Gisele: (after an uncomfortable silence) So, you have any plans for the summer? Jose: I was thinking about going away on vacation, but I have reservations. Gisele: Oh yeah? Where are you heading? Jose: I’m not even sure I want to go. Gisele: Then … why did you make reservations? Categories: fiction, Scecond Seat on the Right | Tags: first date, Flash Fiction, Funny, Gisele, homonyms, Humor, humorous fiction, Jose, last date, micro fiction, scene, short fiction | Permalink. 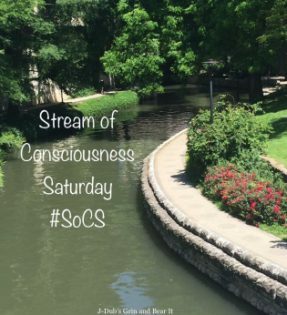 Your Friday prompt for Stream of Consciousness Saturday is “Why/Y.” Theme your post on a word that starts with “Y” – bonus points if you start or end your post with “Why.” Have fun! “Yeah,” I replied. But then I got to thinking. What if I’d been buying, say, mouthwash: might she have asked, “Did you forget the garlic bread”? A cucumber? …okay, never mind. You get the picture. Whether you want it or not. So yeah, it’s probably just my imagination running away with me as usual, but having the cashier comment on my food kinda weirds me out. Categories: Blogging, Funny, Life, Opinion, Random | Tags: #atozchallenge, absolutely not A to Z Challenge 2018, grocery store checkout, Humor, humour, inspiration, judgementalism, support, WordPress | Permalink.